Quebec Premier Francois Legault said there was no Islamophobia in Quebec and closed the door on the idea of designating a national day to combat the problem. Premier Francois Legault’s statement that Islamophobia does not exist in Quebec was denounced by Muslim groups as “offensive and inexcusable,” prompting Legault to clarify his statements on Friday. The National Council of Canadian Muslims called on Legault to retract the remarks made Thursday, two days after the second anniversary of a mosque shooting that killed six Muslim men in Quebec City. 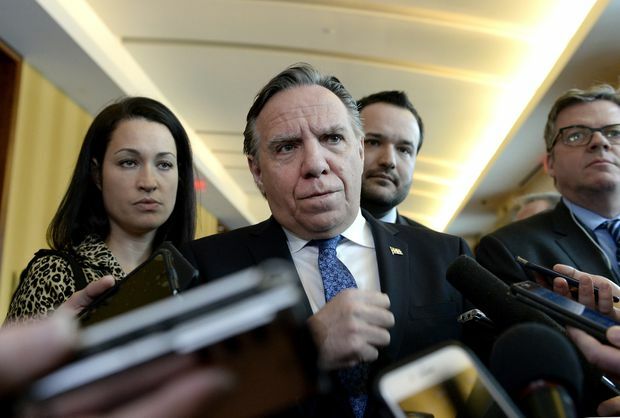 Speaking to reporters at the end of a caucus meeting, Legault said there is no Islamophobia in Quebec and closed the door on the idea of designating a national day to combat the problem. But on Friday his office sought to clarify those comments, saying the premier meant to say that Islamophobia exists but it’s not widespread. When reached by phone Friday afternoon, Gardee said his group welcomed the premier’s acknowledgment that Islamophobia exists in Quebec and hopes to work with the government to tackle the problem. “In our view, taking the ostrich approach and putting your head in the sand is not going to solve a problem or make it go away,” he said. In Ottawa, the Commons heritage committee recommended last year that Jan. 29 be declared a “national day of remembrance and action on Islamophobia and other forms of religious discrimination.” Toronto Mayor John Tory announced this week that the city was proclaiming Jan. 29 a day of remembrance and action on Islamophobia. Legault’s original statement drew a swift reaction from opposition parties and Muslim groups, including the mosque that was targeted in the 2017 shooting. In a scathing letter addressed to the premier, mosque president Boufeldja Benabdallah said he felt betrayed by the comments and expressed fear that they would encourage the fringe group of people who commit Islamophobic acts. “I appeal to your generosity and your intelligence to remain the premier for all Quebecers, and not just those who elected you, to ensure this wound doesn’t become an insurmountable fracture that your government will be responsible for and will be part of the history of our country,” he wrote to Legault. “It’s not very constructive to deny that there are acts of violence that stem from hate of Islam when we have families, women, mothers, children, who live this violence and are living witnesses to this violence,” she said. The controversy came as Quebec provincial police reported the arrest of a man who allegedly appeared in a video published Tuesday praising Quebec City’s mosque shooter and expressing hatred toward Muslims. Pierre Dion, 49, appeared in court in Laval Friday on two charges of inciting hatred against an identifiable group. Statistics Canada reported in November that the number of hate crimes reported to police rose sharply in 2017, fuelled by an increase in incidents targeting blacks, Jews, and Muslims. In his letter, Benabdallah noted that the Quebec City mosque has been the target of a long list of Islamophobic incidents, including swastikas painted on the walls, a pig’s head left at its entrance during Ramadan, insulting pamphlets handed out in the neighbourhood and excrement flung at the door. In August 2017, a car belonging to the mosque’s former president was torched. Two men were later arrested and charged in connection with the incident.